The 2018 Iroquois Springs camp season had its official kick off with New Family Orientation. 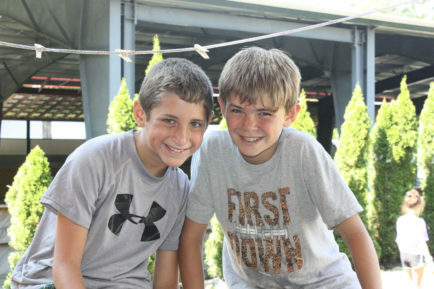 Sunday, May 20th, first time campers and their families came to camp for an afternoon of fun, food and friends. 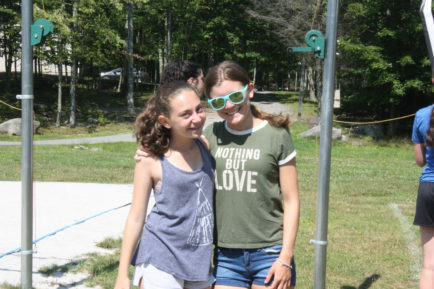 Campers had a chance to meet their group leaders, get to know other new campers, and learn more about the exciting activities and traditions they will be participating in this summer. Families enjoyed time together touring camp and having a delicious bar-b-que lunch. It was an overall amazing day and we are so happy that so many families were there to kick off the camp season. While campers and staff were busy having fun and getting to know one another, parents had the opportunity to meet the camp directors and many of the key staff members to ask questions and learn more about camp life. Information about programming, the health center, dealing with homesickness, bunking, and so much more were covered, and parents walked away feeling well informed and better prepared for their camper to begin this exciting journey. All topics were well received, but one topic that stood out with a round of applause was when Girls Head Counselor, Rosie, spoke about “camp gifts” and “bunk junk”. In recent years, the amount of “stuff” that campers are coming to camp with has increased and has made it harder for campers to manage their space. The considerable amount of camp items being sold, and the pressure to buy it all, is definitely being felt by camp parents. We can appreciate wanting your camper to have their camp bed made up with all the comforts of home, and there is no doubt that items like decorate pillows are attractive and fun, but when there are too many, there is less space for the camper. These lovely (and costly) items only get tossed on the floor when it’s time for campers to go to sleep, and do not usually stay clean. To give your camper the space they need and can manage, and to make packing a bit easier, have your camper pick a few of their favorite pillows and leave the rest at home to decorate their rooms throughout the year. And when it comes to camp gifts (aka “trunk gifts”) that are now being packed for campers to open when they arrive at camp, there is no need, it only creates competition between bunkmates. We are true believers in “less is more” when it comes to packing for camp and most importantly…the opportunity to go to camp is the ultimate gift, no extras needed. The best part about the Iroquois Springs experience, and what we are so proud of, is that camp is not about the “stuff” you bring. It’s all about the individual and the real-life connections campers make to one another. The overabundance of stuff is unnecessary in a place that promotes kindness, empathy and a non-competitive environment. Camp is about traditions, friendship, gaining independence, becoming leaders, building resilience, taking on personal challenges and discovering new interests. We are committed to giving campers a summer filled with experiences that build all of these skills and helping them create memories that last a lifetime. We can’t wait for the buses to roll in for what’s going to be a fantastic and memorable summer!